I am sharing a gorgeous collection of 11 Medieval Lady Images today. The dresses and hats are just stunning. The details of the outfits are amazing. It must have taken a long time to sew them. Almost all the hats have large, dyed feathers on them. Some have so many feathers you cannot tell where the fabric is. There are two pieces of Victorian scrap included. So nice to use in your Historic themed Craft or Mixed Media Projects or Cards! First up is a new addition to this site. This Medieval Lady is wearing a gorgeous outfit in shades of Teal and Forest green. She has a beautiful face and amazing eyes! Above is a Gorgeous Medieval Woman Wearing A Red Dress Image! 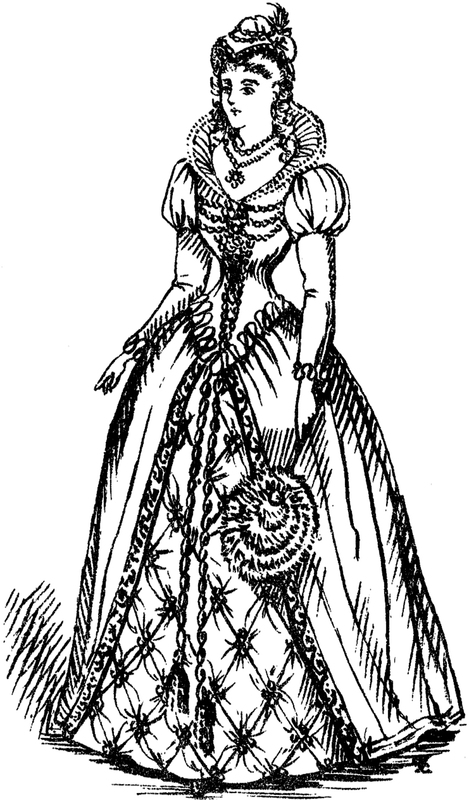 This lady wearing a red dress with a white ruffled neckline and white lace. 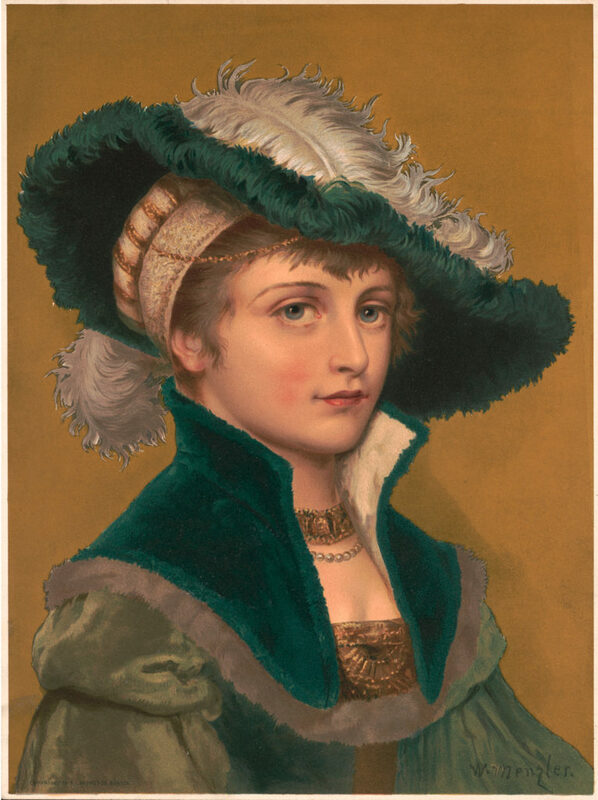 She is also wearing a large red hat, a gold and red necklace, and is standing in front of a green and gold patterned background. 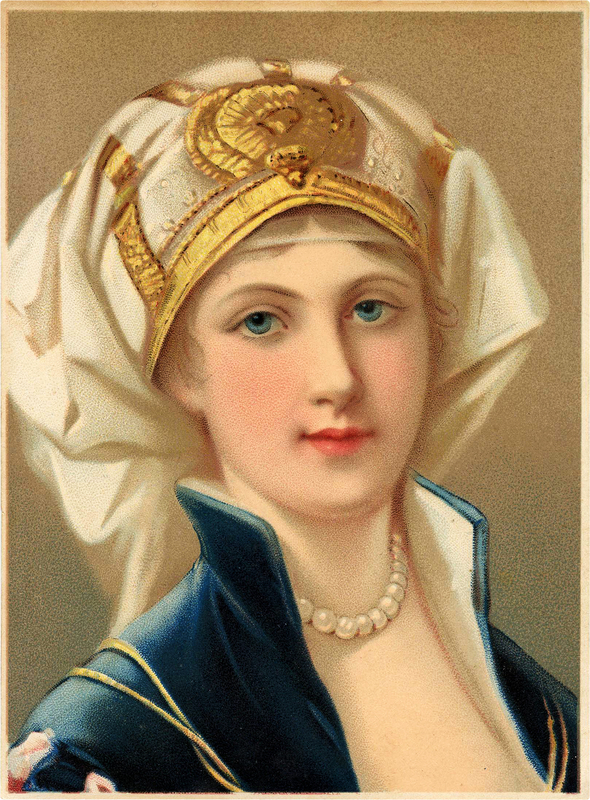 Seen above is a Vintage Stunning Medieval Woman with a Scarf Hat Image! What an Extraordinary Beauty this Woman is! This gorgeous image of a woman wearing an elaborate gold embellished ivory silk headdress that hides her hair is breathtaking. Her beautiful blue eyes, slight smile, and alabaster skin gives her a royal look. She wears a royal blue dress that looks like velvet and a strand of large Pearls. Here is another Vintage Medieval Lady Image! Shown above is a Stunning young Woman wearing a Blue Velvet Dress and matching Hat with Ostrich Plumes. I love the quilted bodice and the layered, puffy sleeves. This Medieval Lady With Red Feathered Hat Image is just lovely! 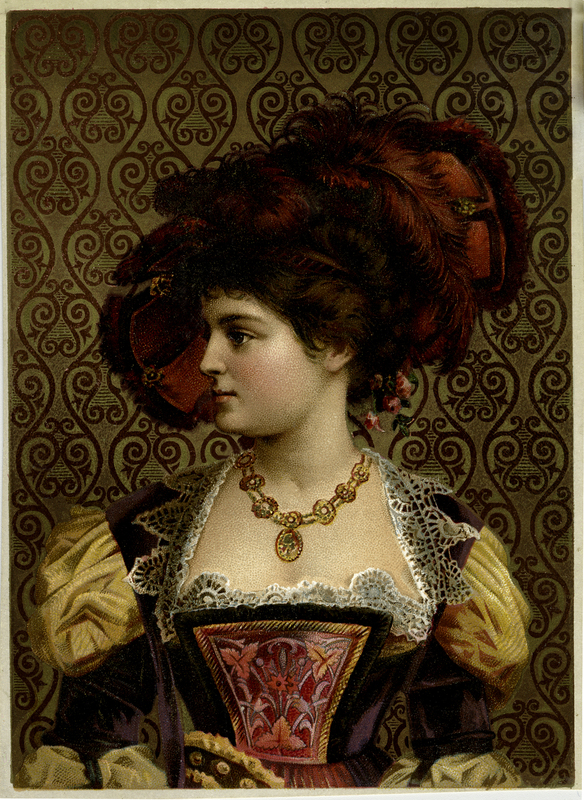 This is a beautiful lady wearing a red feathered hat, large necklace, and a Renaissance style dress. She is standing in front of a fancy printed gold and red background. 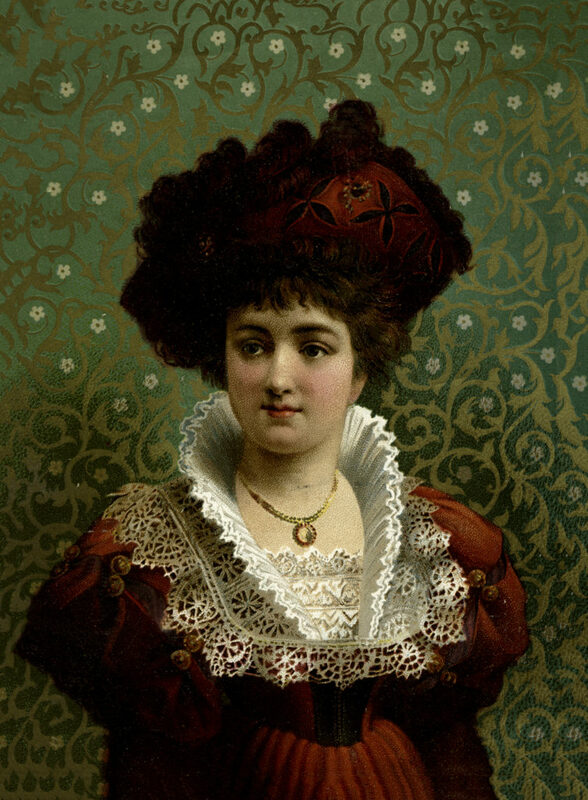 This is a Renaissance Woman is wearing a red dress with a white ruffled neckline, and white lace. She is also wearing a large red hat, a gold and red necklace, and she is standing in front of a green and gold background. Such striking colors on this one! Above is a charming illustration showing a Girl dressed in Medieval Clothing. Her green dress with lovely yellow and reddish patterns is quite elaborate and so colorful! She wears a large red hat with plumes. This is a really lovely Old World Christmas Image! Shown above is a Girl with a beautiful face who is holding a branch of Holly! 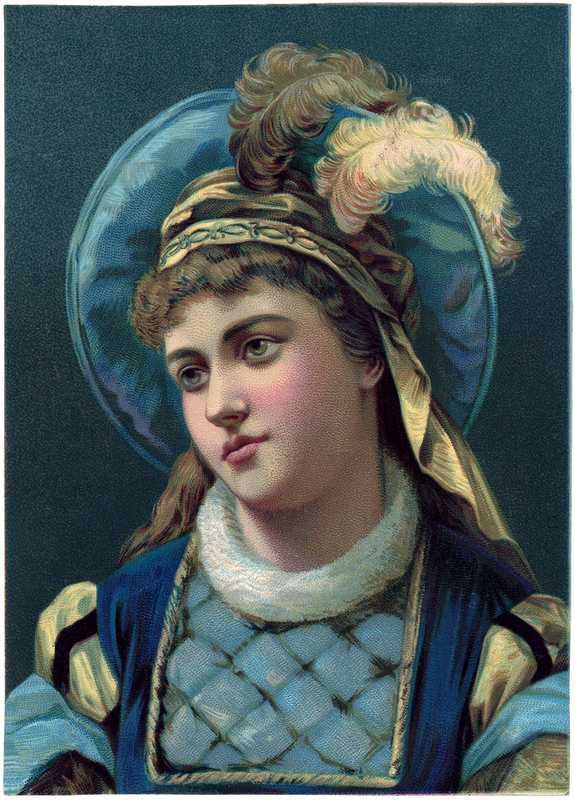 She appears to be wearing a Medieval style Costume with a heavy Gold Cross around her neck. Very pretty! 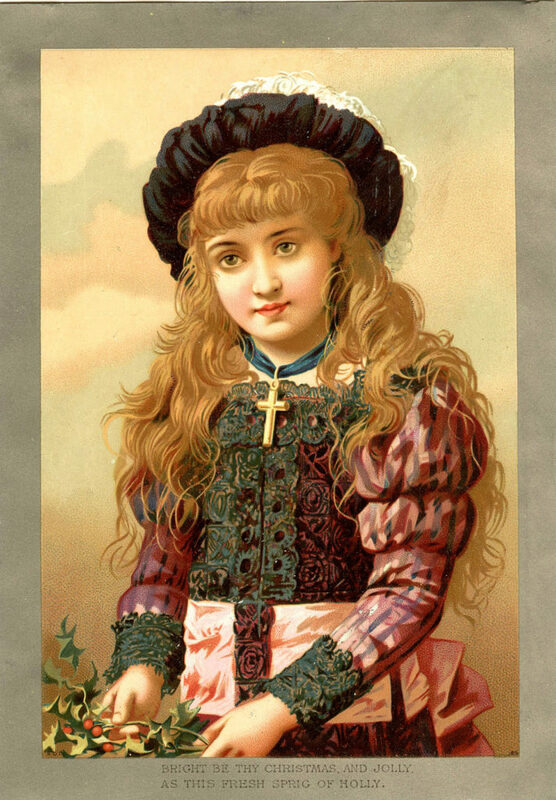 This cute lady is from a Circa 1880 Costume book in my collection! The charming illustration shows a lady dressed in Medieval Clothing. Her dress is also quite elaborate with lovely, intricate patterns. She carries a round fan in her hand. Shown above is a Stunning Medieval Woman in Fancy Blue Dress Image! This portrait of a beautiful woman with long, curly red hair is stunning. 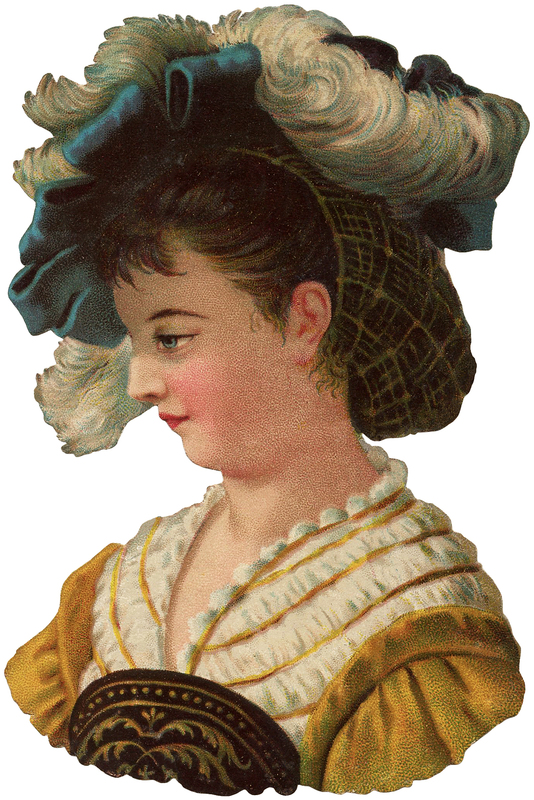 She is wearing a plumed hat that looks like a large tam with teal tinted feathers. Her dress is blue with short puffed sleeves including pink insets and gold topstitching. She wears a white blouse with ruched bodice gathered into ruffles at the neck. Her jewelry consists of long gold chain necklaces and tiny blue drop earrings. A yellow rose is pinned to the bodice. 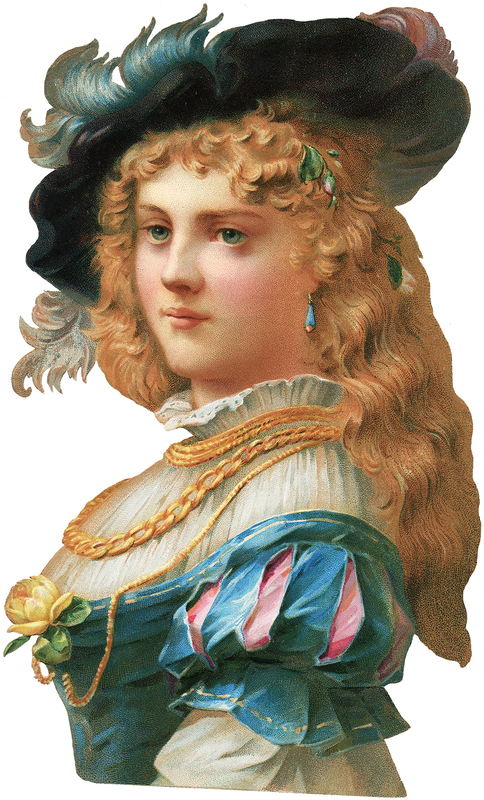 This Elegant Medieval Woman in Large Feather Hat Image seen above is a great piece of Victorian scrap. 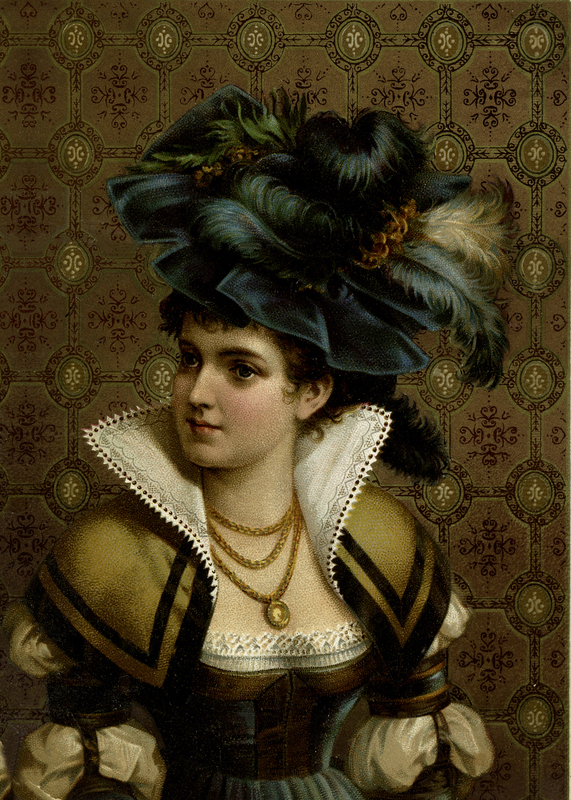 This is a portrait of a dark-haired woman wearing a large white feathered hat with teal bows that look like velvet. Her long hair is in a snood. She wears a beautiful gold gown with a cream collar accented with gold piping and a large brown and gold embroidered front. I hope you enjoyed this curated collection of 10 Medieval Lady Images. You might also like our 10 Free Mother’s Day Images HERE! 50 Best Free Gardening Images HERE! « DIY Aged French Pitchers & free printable! Just FYI, as a former student of womens’ fashion, none of these are medieval. They are all Renaissance. That doesn’t change the fact that they are gorgeous. Thanks her sharing them. Thanks for clarifying JacLynn and yes, I agree they are gorgeous! 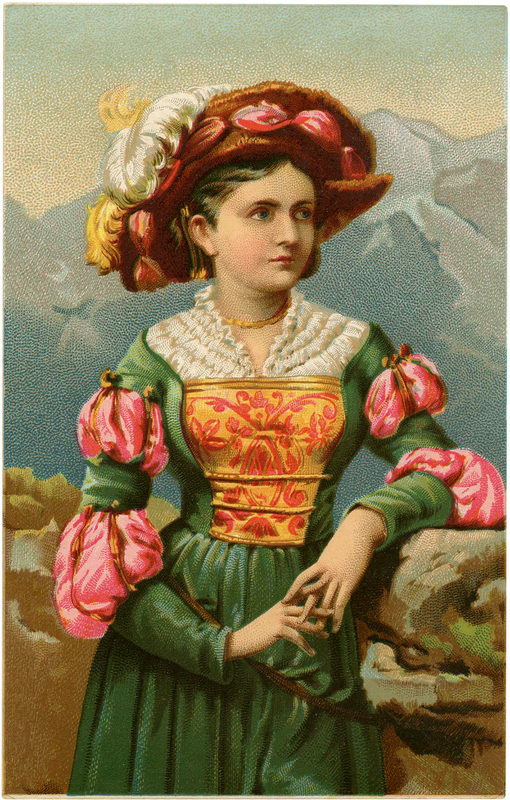 green dress -resting her arm on a stone wall with mountains in background. It appears she is chained to the wall! Would you be able to share more information about this painting? I am so glad you like them. I am not sure about the image you mentioned, I do not have any information on them, I just love the elaborate and beutiful dresses and hats! Wow, these images of these lovely ladies are really something else. I really love their attire, their hats, their jewelry, they are dressed so beautifully! I can’t imagine how many hours of time go into these outfits. I really applaud the dressmakers and tailors of that era. They really knew what ‘classy’ dressing meant, not like today. I really love this section of what you chose for us! I love the attire from this era too Irene, so beautiful and detailed! Gorgeous medieval images! thank you. So glad you like them Bev!